My favorite thing to plant in my yard are herbs. They are easy to grow and have so many benefits, that I like to call them the gateway drugs of gardening. If you are considering making some changes to your space and want to try your hand at gardening, herbs and lettuces are the best way to start, and will definitely get you hooked. I cook with the herbs picked fresh out of my garden on an almost daily basis. I spread the herbs around in pots on my patio and in my yard. Some herbs, such as mint, will easily spread throughout a garden bed, so I keep it in a pot. 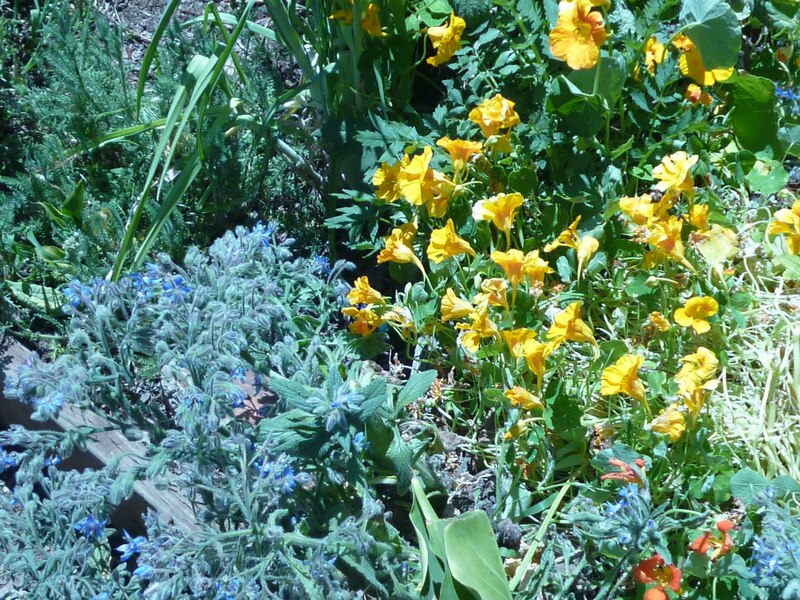 However, other herbs, such as rosemary, are better behaved so it can be planted out in the yard where it grows as a beautiful perennial with purple/blue flowers. Herbs have many wonderful qualities, but since this month is all about companion plantings, the focus here will be on their benefits when planted among your flowers, fruits and vegetables. 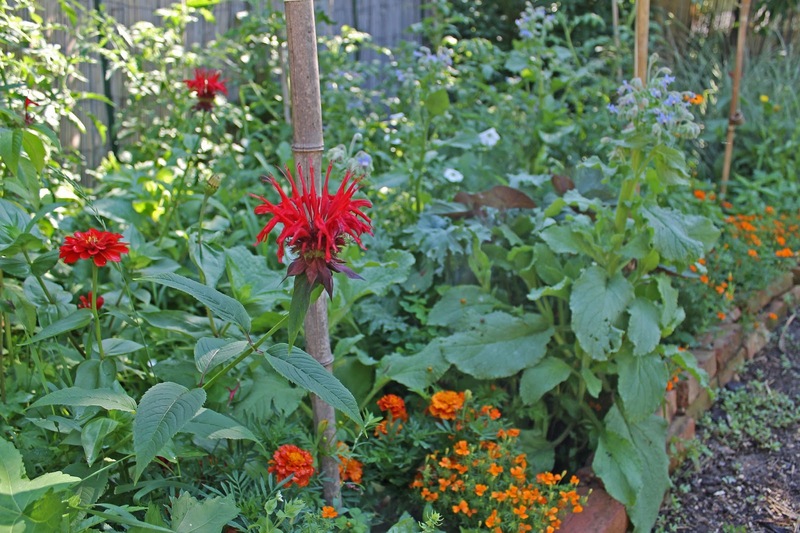 First up are the 3-B’s: Basil, Bee Balm and Borage. All three are great companions for Tomatoes because they help improve both growth and flavor in Tomatoes. Basil. 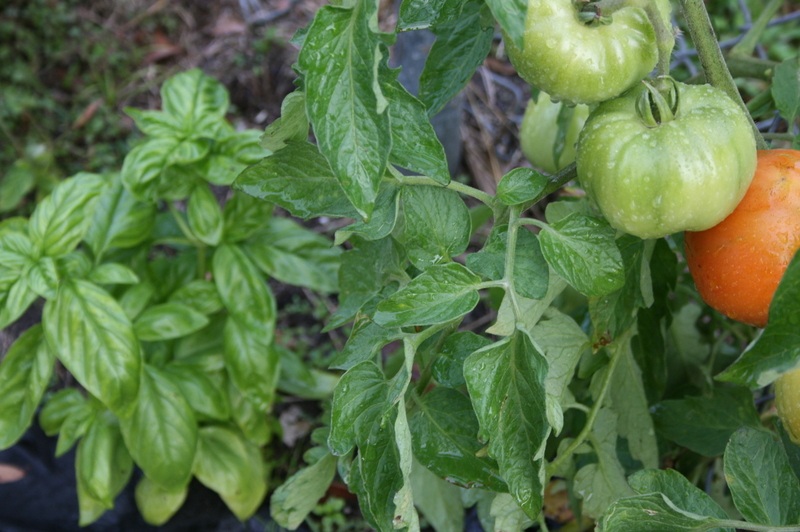 Basil repels thrips, flies and mosquitoes, protecting companion-planted tomatoes from these pests, as well as from milkweed bugs, hornworms and aphids, and acts as a natural fungicide. Basil likes full sun just like tomatoes and has similar watering requirements. Plant three Basil plants to one Tomato plant. Basil is considered an annual, so it needs to be replanted or seeded each year. Use mulch to help it retain moisture, and pinch back the leaves to keep it bushy. If you also decide to grow a few plants in containers, you can bring them in before the first frost and use them over the winter. Bee Balm. Bee Balm is very good for attracting beneficials such has butterflies, hummingbirds and pollinating bees. It is also very pretty perennial. Bee Balm likes full sun. Plant it in well-drained soil, with a soil pH of 6.0-6.7. You can get another round of blooms if you pick the flowers. It can tolerate drought, but keep moist and use mulch. 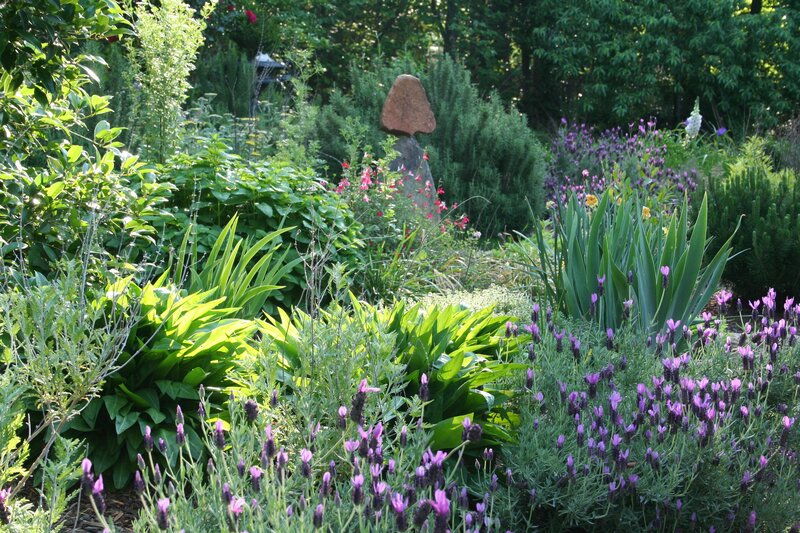 In late fall, cut the plant back to several inches from the ground. Borage. Borage is a lovely companion for Tomatoes. The purple flowers and fuzzy, silvery green leaves are a nice compliment to the lush foliage for the tomato plants. Borage attracts bees and is known to repel tomato hornworm and cabbageworm. The only downside to Borage is that it may self-sow, so just watch it so it doesn’t go wild. Borage is an easy to grow annual that thrives in poor soil. It likes good light and regular watering, although it can survive a dry spell if you mulch it well. It grows to a height of around two feet, but doesn’t need staking. Next up, More companion herbs. . .
← Not In It To Win It: The Good Sportsmanship Award Goes To. . .
“Gateway drugs of gardening” I like that. I wish I could grow basil like that. We have such a hard time with it, growing it under lights in the house, then having to protect it between house and garden, then finally planting in the garden when it’s warmer. Still we have to protect it at night because of the cool temps. Now borage will grow so well, yes, it self sows, but the bees love it and so do I.